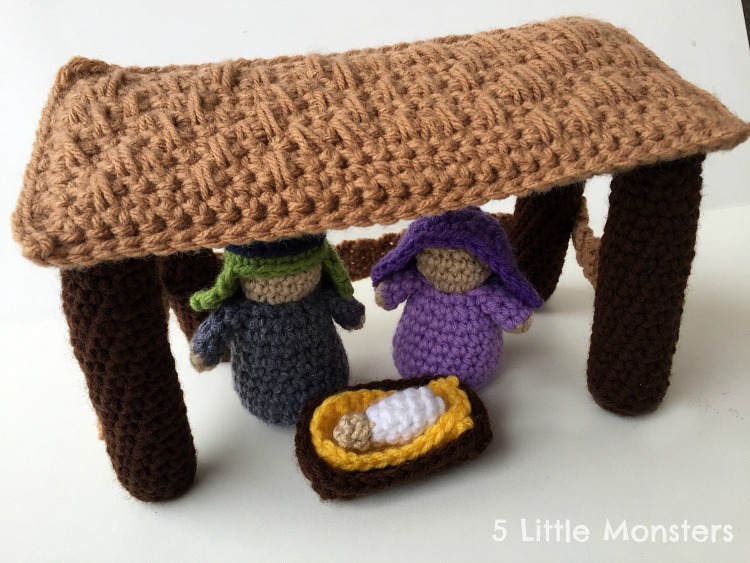 A couple of weeks ago I shared my mini nativity pattern that included a Mary, Joseph, and Baby Jesus in a manger. As I was working on it I had the idea to make a little stable to go along with them. I wanted to make something pretty simple and that would stand up on its own. 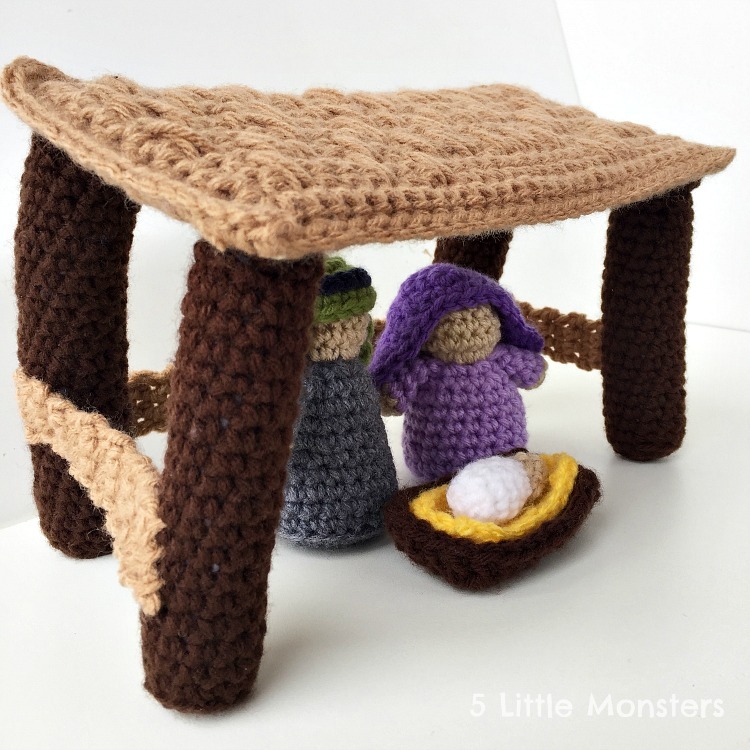 I kind of took inspiration from the Little People Nativity set. We used to have one, some of the pieces have gotten lost, but the stable in that set was basically 4 pillars holding up a roof. The roof, if I remember correctly had a slight peak to it. I didn't think I would be able to make that work but I decided to try something similar. I made a flat roof with 4 pillars holding it up and then added some pieces between the pillars to keep them in the right place. In my head I pictured the roof sort of slanting forward so I made the back pillars slightly taller. Honestly, if I were to do it again I probably would just make them all the same height because it didn't work as well as I had hoped. It sort of just makes the stable look like it could tip forward at any moment. So, if you make it you can choose to do the same as I did and make the back taller, or just make them all the same height and call it good. To help the roof keep its shape and not be floppy I crocheted two roof pieces and then cut a piece of Stiffen, heavyweight interfacing from Fairfield World, to fit between them. Then I crocheted around the outside of the two pieces, sandwiching the interfacing in between. To give a little texture to the roof I added some long stitches randomly on the top. I wanted to give it almost a thatched type look. 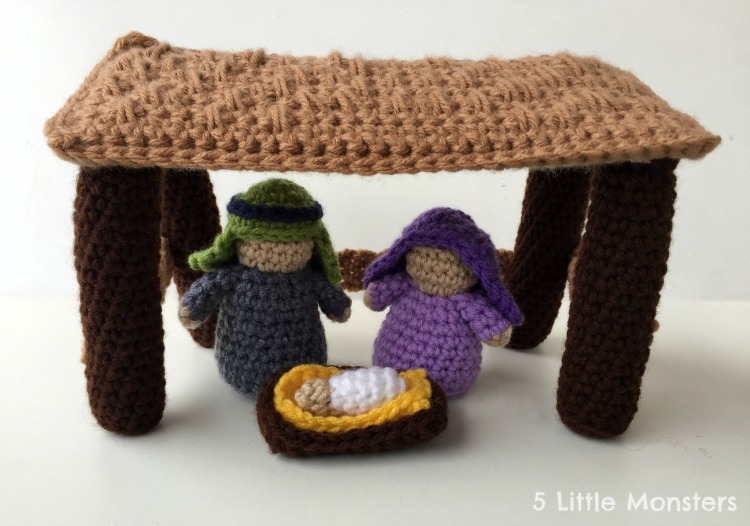 I don't know how accurate that is for Bethlehem 2,000 years ago but, like I said, I was using the Little People version as my model and that was how that one was, and I just wanted to add some sort of visual interest. 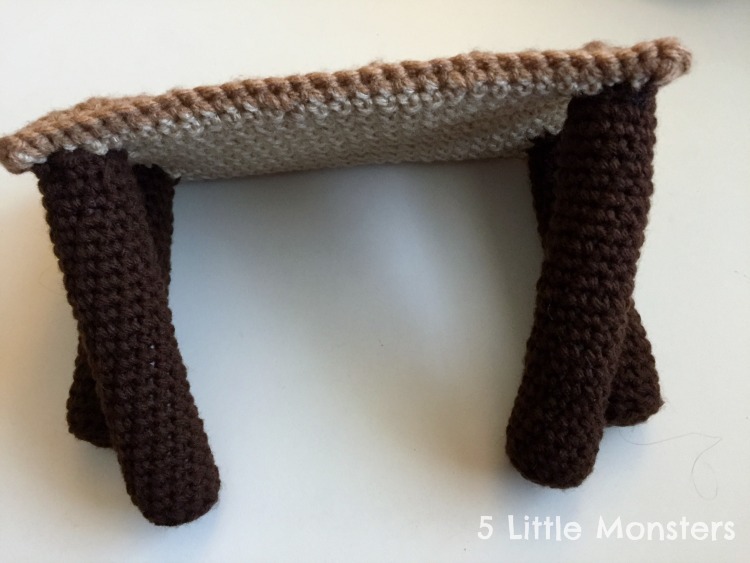 The pillars are worked in the round, amigurumi style (spiral), and stuffed, then sewn to each corner. 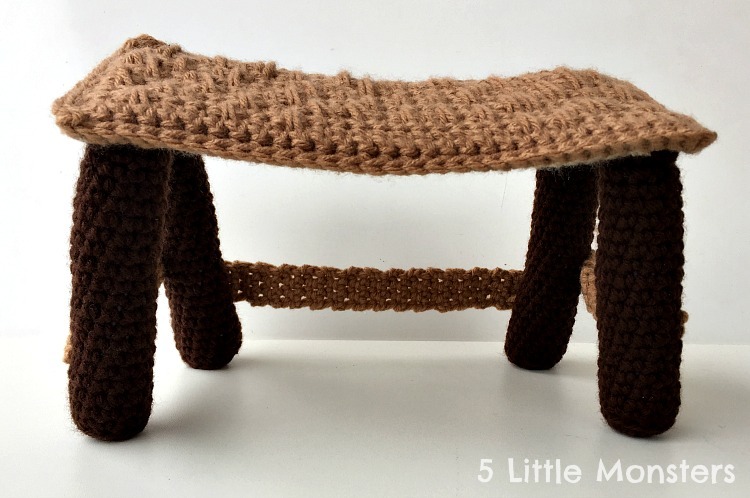 Last, thin single crocheted strips are sewn to the pillars to hold them in place. 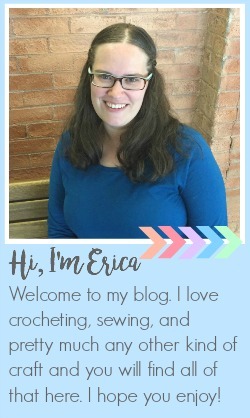 For the roof you will make 2 identical pieces in size and shape, the only thing you will do differently between the 2 is that as you work the top, or outside, piece you will randomly work you single crochets into a stitch below the one you would normally work into. 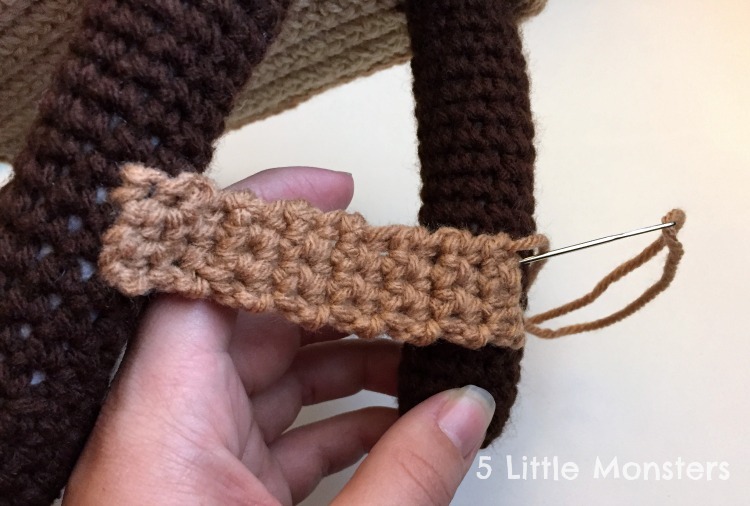 To do this simply insert your hook a row or two or three below the stitch you would be working into, pull up a loop until it is even with the row you are working, yarn over and pull through just like you normally would for a single crochet. I didn't really follow any sort of pattern for this part, just occasionally on the right side rows make some long stitches (it doesn't really matter which is the right side except that you will want your long stitches on the front so only work them every other row. 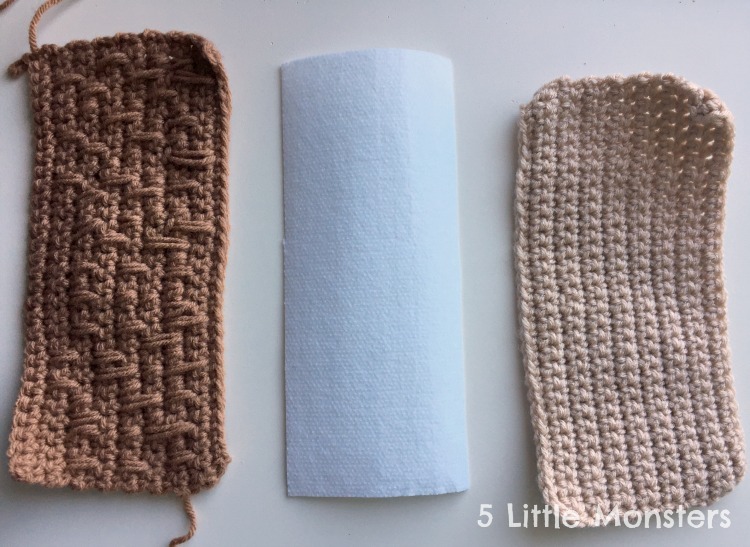 Cut a piece of Stiffen just smaller than the rectangles you crocheted. Layer the pieces so that you have the interfacing between the crochet pieces, using the yarn that you did not cut, sc all the way around the roof pieces to make one piece. I made my pillars two different lengths as I mentioned above, you can do the same or make them all the same length for a flat roof, if making them all the same I would make them all the shorter length. 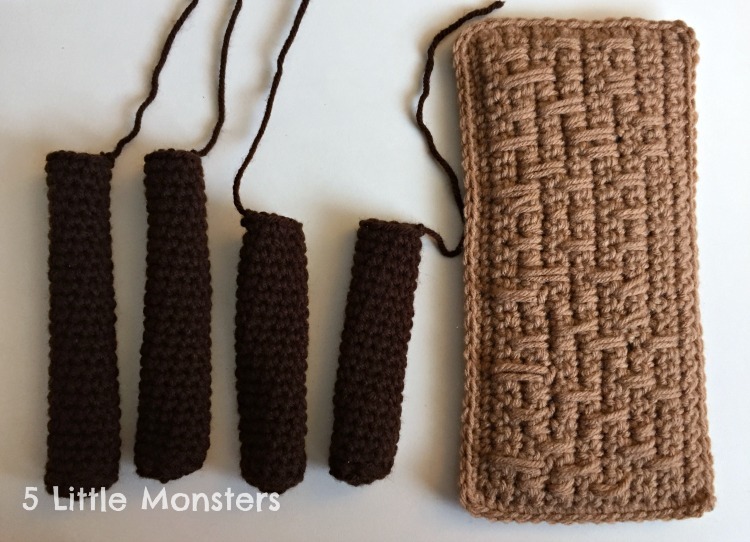 with tan yarn you will make 1 long and 2 short supports, make them the length needed to reach between the pillars on the side and back, you may need to adjust the length depending on how tight you crochet. Once your supports are added the stable should stand up on its own. The Stiffen really helps keep the roof flat and the supports keep the pillars from spreading apart too much. 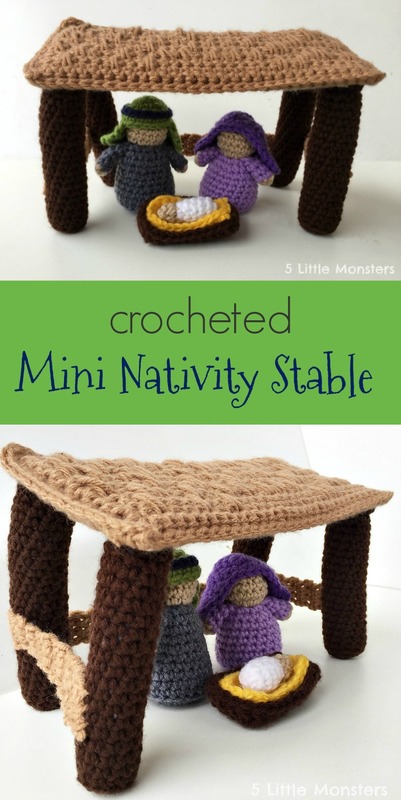 Add you Mary, Joseph, and Baby Jesus and you have a small, kid friendly set.